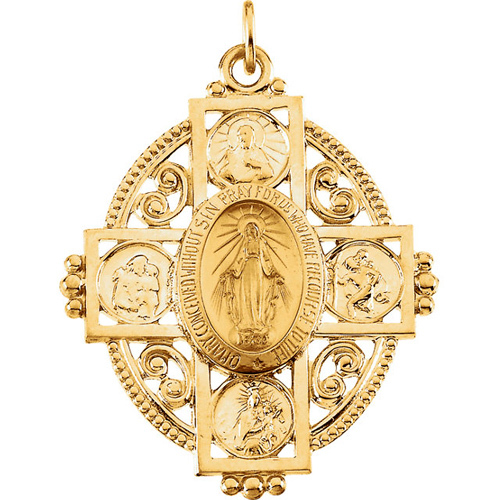 Polished 14kt yellow gold miraculous oval medal cross pendant. Dimensions: 35mm by 28mm. This item is larger than a quarter. Chain not included. Weighs 4.11 grams. Inscription: O MARY CONCEIVED WITHOUT SIN PRAY FOR US WHO HAVE RECOURSE TO THEE. love the medal. the piece that goes around the chain is worthless. lost the medal the first night. it was in the bed. we are having it remade , so it won't happen again. paid a lot of money for this piece, it should have had a a much better piece for the attachment to the chain. This miraculous medal is beautiful. I use it daily to work since I believe in the presence of our lady. You actually get a bonus. At the corners of the cross are the sacred heart of Jesus, St. Joseph, St. Christopher, and the scapular. In essence it is a 5-way medal! Wonderful!